The Baobab Tree is a gallery in the Village of the Arts, in Bradenton. A couple of years ago, when I was looking around for venues where I could display my mosaics, I looked at all the galleries in the Village and thought the Baobab would be a good fit because it carries such an eclectic mix of styles and media. 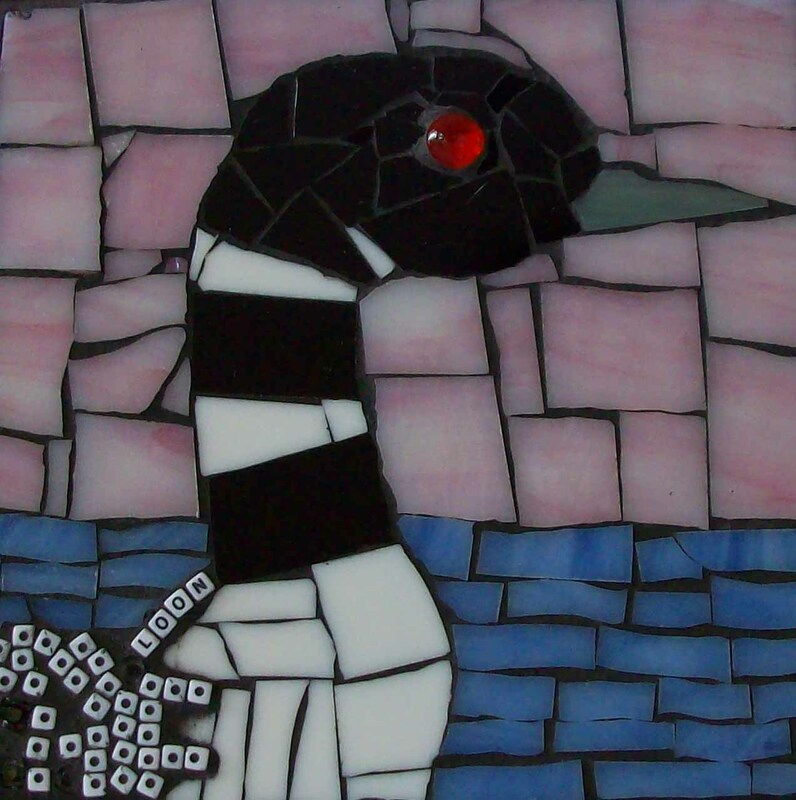 I approached the owners, Chris and Gordon Turner, and they have been kind enough to show a few of my pieces every season. They have also become good friends. This year, they are showing several of my Avian Portraits, including the Toucan pictured here. Chris and Gordon travel every summer and bring back artwork from Indonesia, Vietnam, Egypt, and other exotic destinations, as well as from their artist friends in the Northeast, where they hail from originally. 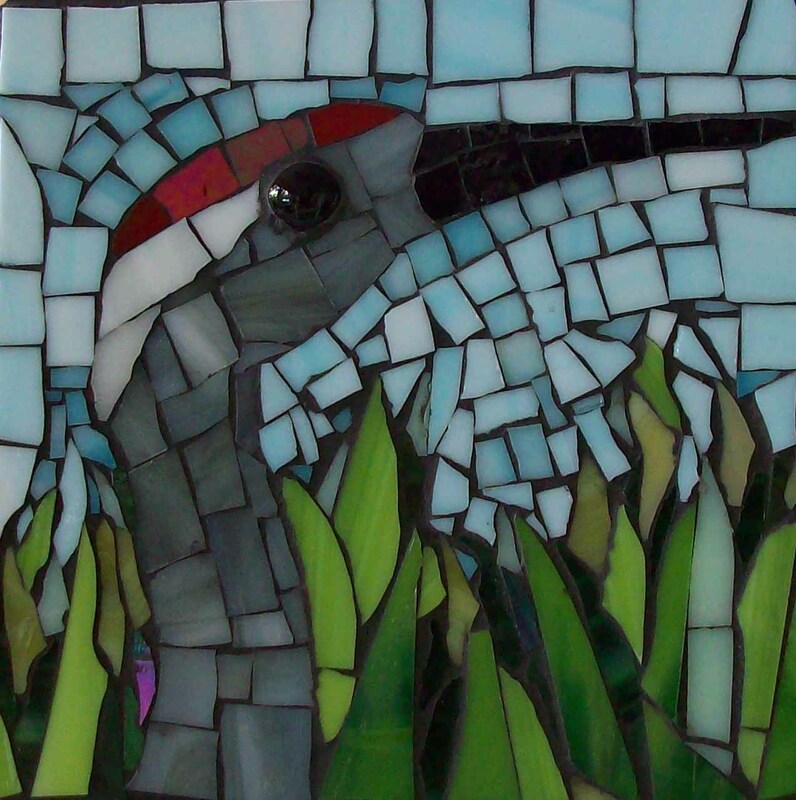 Both have taught art and continue to produce it; Chris is an accomplished painter in acrylic and watercolor, and Gordon creates charming fish and other sculptures using weathered wood and found objects. The gallery shows their work as well as local and not-so-local artists. The Baobab Tree is open on the First Friday of the month and the first Saturday, and other times by appointment. The gallery is located at 1113 12th St. in Bradenton, telephone 914-447-3795. The next First Friday opening is October 1, from 6 to 9 p.m. Please visit! 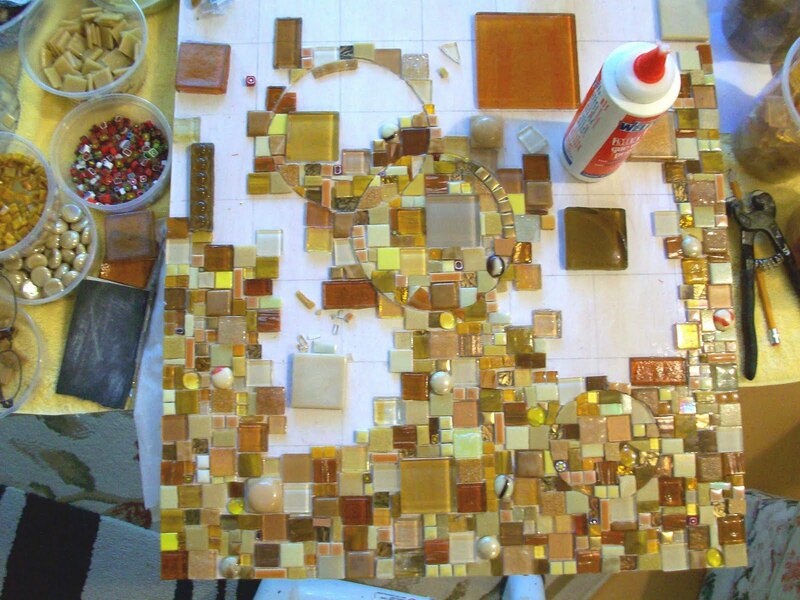 Here's a progress report on my current commission -- a mosaic piece to cover an electrical panel. This is the bottom half (it's about 20 by 40 inches total) -- and there is a close-up on the right. 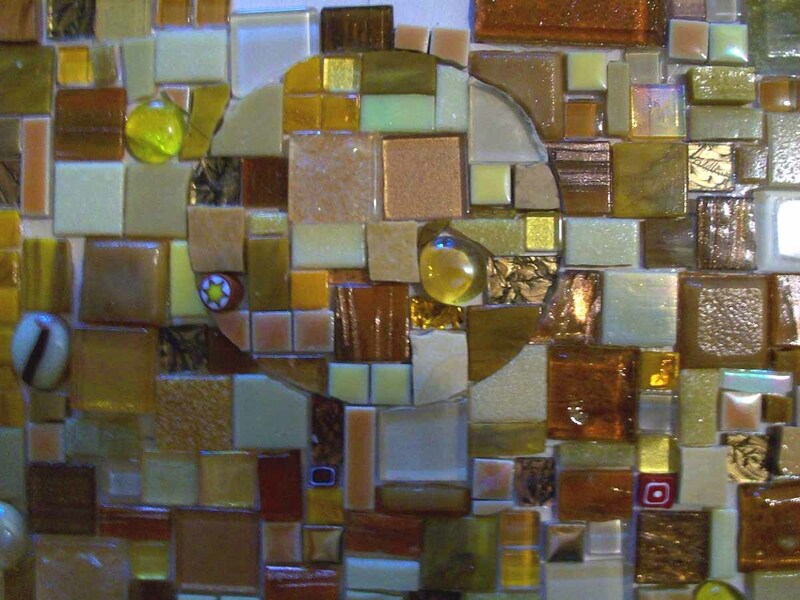 You can see how the circles will be highlighted after I grout it. I'm really enjoying using all the different sizes and colors, but it's a painstaking process. I found some beautiful glass 2" squares at a remainder tile store in St. Pete, called Tons of Tile -- a great source for odds and ends. The glass pieces that were too clear I painted on the underside with glass paint. You can see two of them in the bottom center and upper left in the top photo; they were a very light beige which I painted on the back with bright yellow, which gives them a lovely golden glow. Finally the mosaic pineapple, which I wrote about last month, is complete and installed in my friend's driveway. 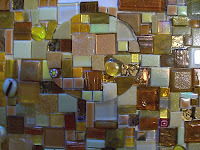 The installation took several days, because the hole it was going in was deeper than the mosaic. First I had to put down a layer of mortar using a 1/8" notched trowel. The next day, when it was dry, I put another layer over that and smoothed it flat. 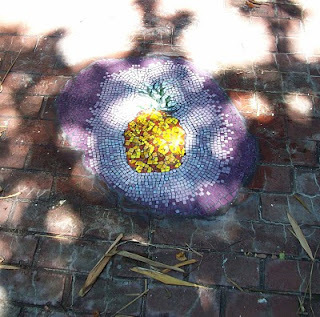 The third day I could install the pineapple, which I had glued to fiberglass mesh, on a final layer of mortar made with the notched trowel. On the fourth day, I grouted, and the fifth day, this morning, I applied a spray sealer. I constructed a makeshift canopy from sawhorses, a tarp, and bungee cords, since it is our rainy season, to keep the rain off while the piece dried. It is a very nice surprise now to walk in the gate and see the pineapple, a traditional sign of welcome. Introducing three bird portraits just completed: Loon, Woodpecker, and Crane. Each is about 7 1/2 inches square. I've been poring over my one small bird book and browsing images online to find likely subjects -- the possibilities are endless! I've done nine birds so far, and I have about 15 more small boards to work with from my salvaged shelves. 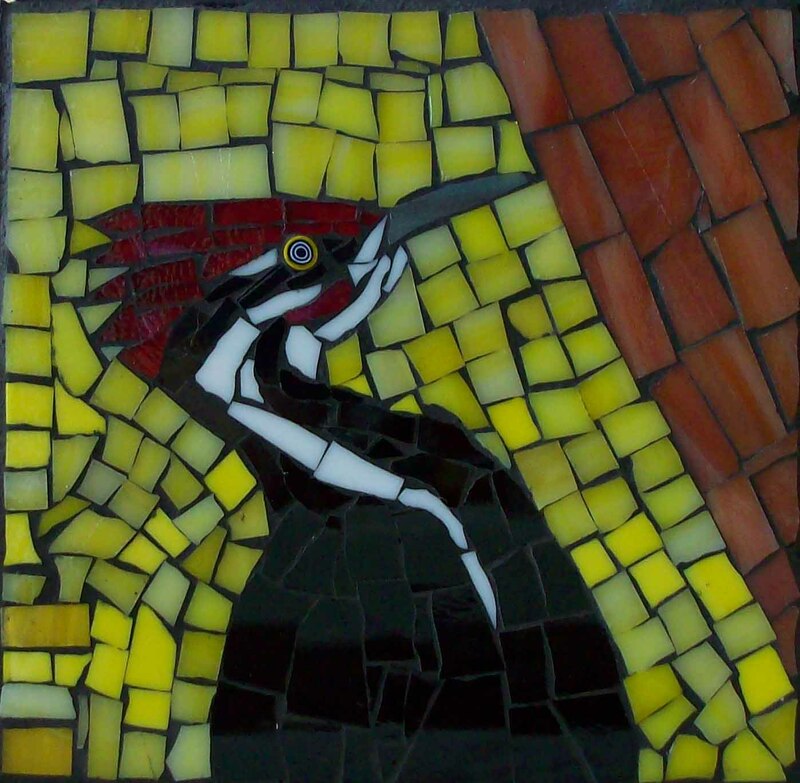 I'm using stained glass, and finishing the edges with black tiles. 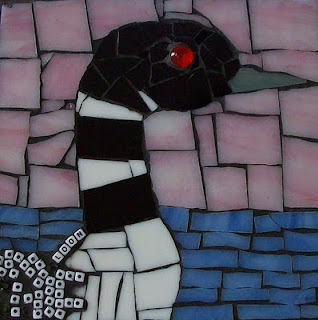 I hope to place a few at the Baobab Tree and Parkland galleries this fall. 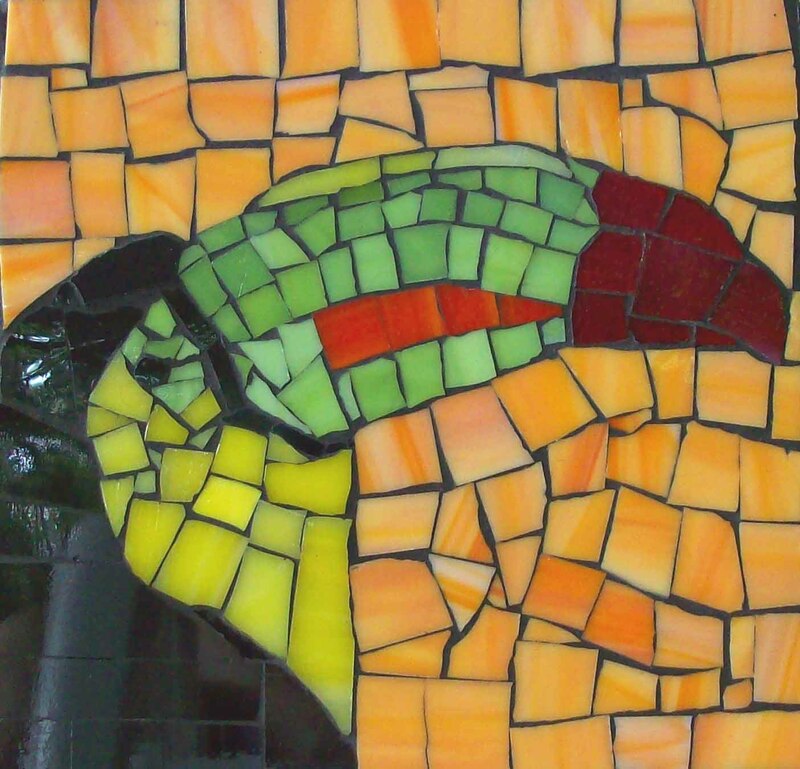 One of the birds, a parrot, is on its way to New York; every year I contribute a small work to an auction that benefits the World Wildlife Fund, hosted by Humanscale, a company that makes ergonomic and eco-friendly office furniture and accessories. They have been hosting this annual auction of wildlife-themed artwork, which they call "Faces in the Wild," every year since 2000. Last year they raised $42,000 for WWF.